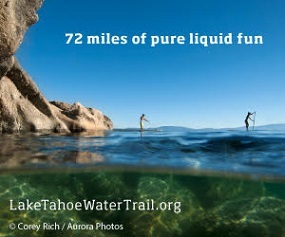 Home » Blog » Word » History » Did you know…Lake Tahoe has an Underwater State Park? Besides crawdads, Tahoe Tessie and Lake Mermaid, a lot of Tahoe’s history dating between 1884 and 1953 can be seen under water on the south side of Emerald Bay since it was designated an Underwater State Park in 1994. Scuba divers are really the only ones who can enjoy this unique park and view artifacts from an era long past. 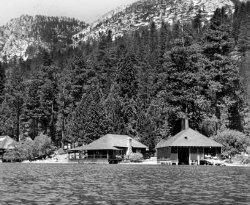 In 1994, the Los Angeles Maritime Museum in cooperation with the California Department of Parks and Recreation installed a mooring buoy at the barge dive site located on the southern shore of Emerald Bay. Two historic barges lay in 35′ of water at this site. This is also the location of a dump site possibly used by Emerald Bay Resort and others from 1884 until 1953. Small artifacts from the dump may be found at the Northwest corner of the western most barge. Please leave all artifacts you see in their place. Emerald Bay Resort was situated on the north shore of Emerald Bay where Boat Camp is currently located. If you dive in this area you will find a variety of artifacts from the resort including telephone batteries, old tires, sinks, toilets, an old pier, a diving platform, at least five dories and two launches. One diver even reported seeing a Model A Ford!